Current Favourite Foundation Combo - 12 Days of Blogmas! Hey, friends! I'm not one to switch out my foundation regularly; once I find one I like I tend to stick with it until it no longer works for me, or I get bored. The latter case happened to me recently - although I still adored my tried and true Nars Sheer Glow, I felt I needed to mix things up a little. So much so, in fact, that I began to mix my existing foundations together in search of the perfect formula. Spoiler alert: I've found it. 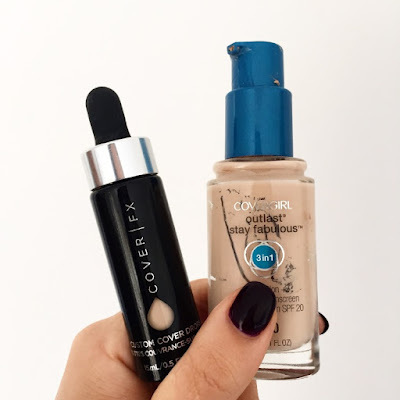 If you're a long-time reader of my blog, you may remember the days where I was obsessed with the Covergirl Outlast Stay Fabulous 3 in 1 Foundation. This stuff is brilliant beyond belief (think medium coverage, satin finish, incredible longevity), although quite limited in shade range. The lightest shade, 810, is just a smidgen too dark for my pasty pallor - hence why I stopped using this bad boy - and I figured I would have to wait until the middle of Summer to break it out once more. However, my saviour came along in the form of Cover FX Custom Cover Drops; in the shade N10 to be exact. This miracle product is a highly pigmented concentrate which can be used to lighten, darken or simply add coverage to any base product. This stuff balances the shade of my covergirl perfectly and slightly boosts the concealing power, all without affecting the original finish. For my skin - normal/combination - this is the best Summer combination I've ever tried. No melting, no sweating and no 'Oh god, I'm breaking out again'. What more could you ask for? Let me know which foundations you're loving at the moment, I'd love to know!